This is officially the largest panorama shot I have taken thus far. 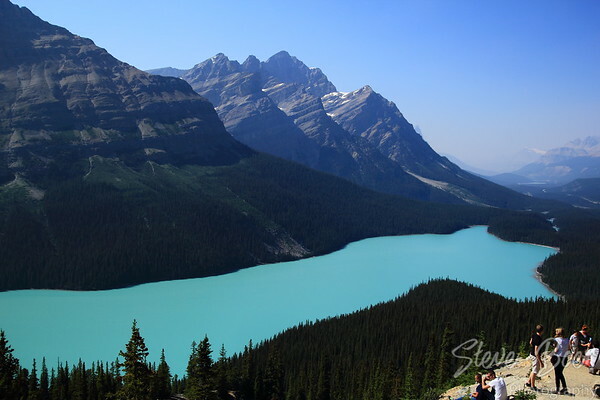 Peyto Lake, in Alberta’s Banff National Park is a busy tourist spot and it’s easy to see why. It’s a beautiful lake (yes, it really is that color) and the viewpoint is only a 5-10 minute walk from the highway. Because of the number of people there, I was in a bit of a rush. So, sans tripod, I just started shooting high from left to right, then down and back left for another row, then back right again for a third row. I ended up with 43 images, so clearly didn’t take the same amount of shots in each row. Amazingly, Microsoft ICE had absolutely no trouble figuring out what I’d done and pasting them all together. The resulting image was over 48,000 pixels wide and over 200 meg in size. I scaled that down by a factor of 6 to post to my website. I thought it looked cool uncropped to show the edges of the individual shots and help get a sense of the scale of it. You really need to click through and view it full screen to appreciate. The second image is a single shot taken with my wide-angle lens from a slightly different viewpoint. This is as stunning place to be taking photos and Steve was wise to have done a panorama – he knows I have a soft spot for them! The raw uncropped pano always is an interesting look … and props for taking 43 photos without tripod and stitching them all together – that takes skill ! Thank you Don, the reblog and your comments are much appreciated! Hey Don, just wanted to say thanks again for the reblog. I picked up a dozen new followers which is about how many I normally get in a month. Have a good Easter weekend! It sure is, and pretty easy to get to as well if you’re in the area.